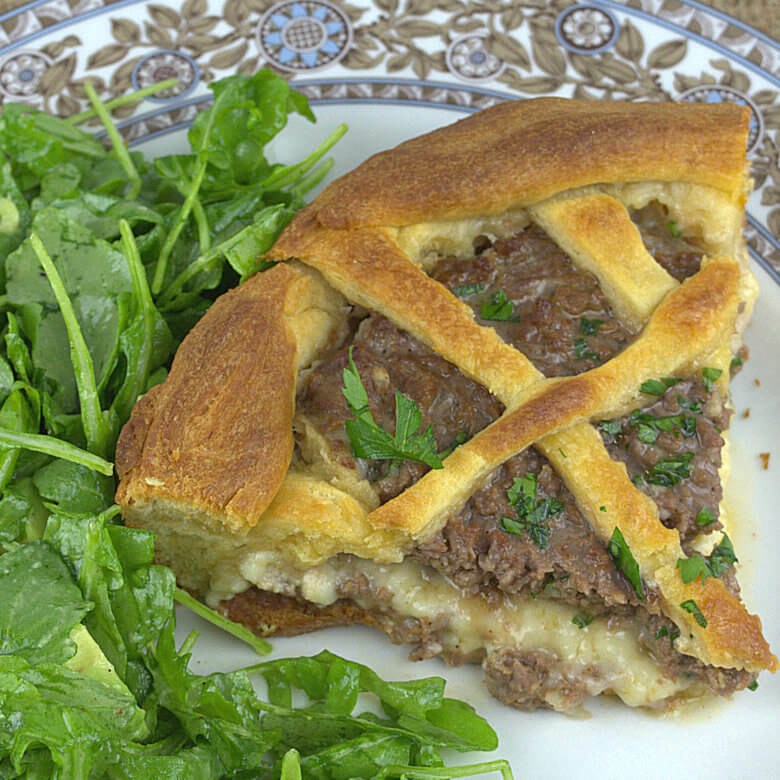 What a treat it would be to have this Ground Beef Pie for lunch or dinner. Eat it while it’s hot…. or cold, if you prefer it that way. Both are equally delicious. Meat pies, or savory pies in general, are often a little heavy. This meat pie is just ground beef and a small layer of cheese, no sauce and a thin layer of dough. If you serve it with a simple salad instead, it is not heavy at all. There are 3 things that will help you make a successful Ground Beef Pie. Flavor your ground beef mixture well, but don’t make it too salty. During the cooking process the meat will lose some of its moisture/fat and thus the flavor will become more intense. Don’t bake it too long. You don’t want the beef to overcook and become dry and dense. Adding soaked bread to your beef mixture will aid in keeping the meat moist. Use a cheese with a flavor. Mozzarella will be great for melting and it’s delightfully stringy, but does not add much flavor. 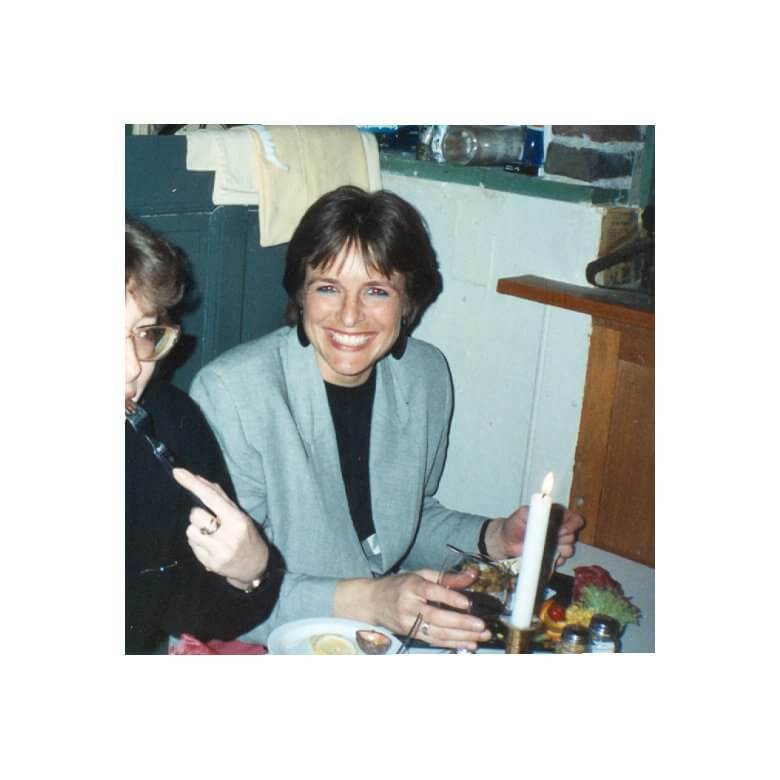 I would suggest to use, Gruyere cheese, Gouda cheese or a cheddar with some age. It is very easy to use and ready for immediate use. The dough creates a crust that is fluffy, and a little sweet. The sweetness of the dough creates a nice combination with the savory flavor of the meat and cheese. In short, this is how you make the Ground Beef Pie. For details, please have a look at the recipe below. Make your favorite ground beef mixture. If you have a winning meat loaf recipe or burger recipe, use that. My mix contains, chopped onion, tomato ketchup, Tabasco, Worcestershire sauce, salt, pepper, spices, egg, bread soaked in milk. Cover a pie dish (bottom and sides) with the crescent dough, keep some (about 1/3) for a simple lattice at the end. Divide the cheese over the bottom of the pie, then divide the ground beef on top of the cheese. Decorate with the remaining dough and slide into a preheated oven. 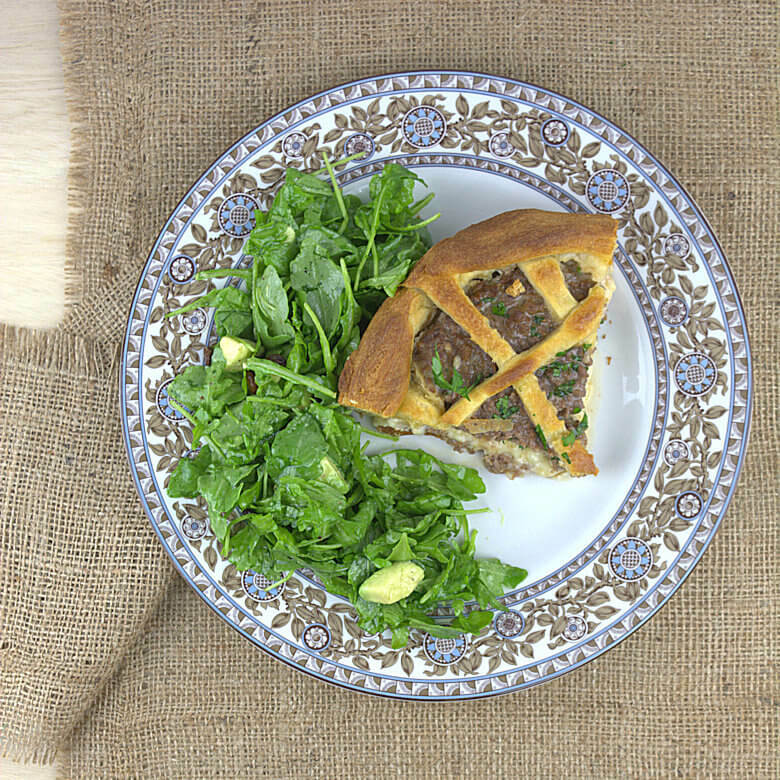 I like to serve this Ground Beef Pie with a simple salad. For this recipe I made a simple salad from arugula, avocado and a vinaigrette. 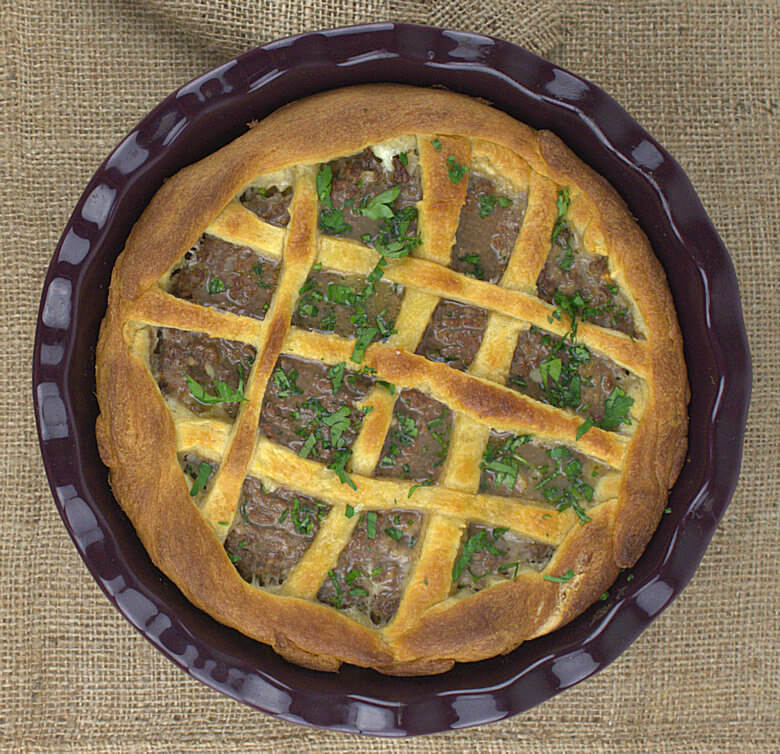 What a treat it would be to have this Ground Beef Pie for lunch. This savory pie can be enjoyed warm and cold. Cut the bread in small cubes and soak in a little bit of milk. Not more than the bread can absorb, approx. 2-3 tablespoons. Place the chopped onion in a bowl, add 1/2 egg, ground beef, soaked bread, salt and pepper, spices, tomato ketchup, Worcestershire sauce, Tabasco and parsley. Keep some parsley for the decoration after the baking. Mix well, but don't overmix. Unroll the crescent dough, but don't separate the triangles. Use your roller pin to better connect the triangles and roll the dough just a little thinner. Cut the dough to cover the bottom and sides of a 9-inch pie dish. Roll out the remaining pieces to create a lattice. Divide the grated cheese over the bottom of the dish. Transfer the ground beef mixture to the pie dish and spread out evenly over the cheese layer. Create a lattice from the remaining crescent dough. Cover the pie with aluminum foil and bake for 15 minutes. Remove the foil and bake another 15 minutes. Take the pie out of the oven, sprinkle with parsley and serve. When you use a smaller pie dish, you'll have a thicker cheese and meat layer, and you'll need to cook it a little longer. Oh my word Marinka, that looks so delicious. Soos ons sal se in Afrikaans…… dit lyk flippin lekker. I’m not the best cook in the world, but I’m definitely going to try your pie. This is a simple recipe; I am sure you can make this. Enjoy, it is lekker indeed.